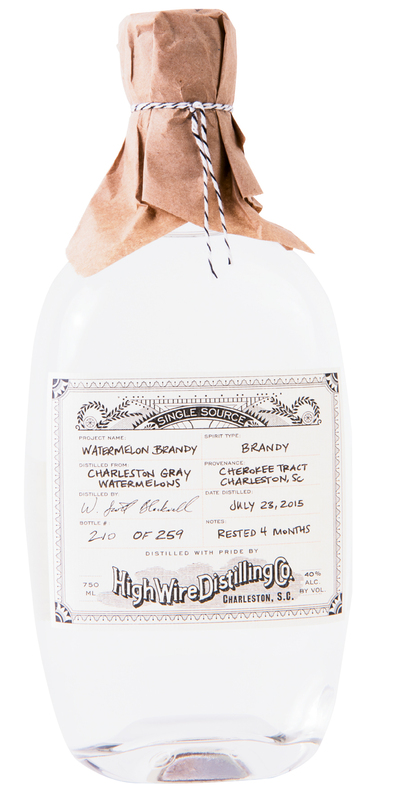 Each August, High Wire brings in more than three tons of local watermelons to distill into their seasonal brandy. After the melons are carved, The Grocery’s Kevin Johnson pickles the discarded rinds for mostarda. Back in the sultry days of August, when brandy was absent from most drink menus, High Wire Distilling Company owners Scott Blackwell and Ann Marshall and their crew unloaded 7,000 pounds of watermelons into their production area on King Street. The fruit was carved and juiced via a hand-pressed metal grate, then finally distilled into liquor. After four months of “rest,” the annual limited-edition brandy—which has a refreshing, full-bodied taste reminiscent of fresh watermelon juice (believe us, it’s far superior to other Jolly Rancher-like booze)—was released and is on sale till the end of December. PHOTO: High Wire brings in more than three tons of local watermelons to distill into their seasonal brandy. The first year, the chef collected about 50 pounds of the rinds. In 2016, he brought double that back to the restaurant; this summer, he nabbed more than 250 pounds. Johnson begins his canning process by shaving off the hard green shell, then chopping the white parts of the fruit into thin, stamp-size slices. The rinds are then simmered with vinegar, sugar, dry mustard, and other ingredients before being jarred and stored. For his part, Blackwell is thrilled that the melons have become a “zero-waste product,” meaning the entire fruit is used. “The Grocery plays a big part in making that happen,” he says. “It’s one of our favorite restaurants, and we appreciate that Kevin makes the effort each year to come in and pick up his share.” Other area chefs also collect the rinds for their own canning projects, Blackwell notes, and whatever’s leftover is donated to Legare Farms for animal feed. “It’s a true community effort,” he says.